The world’s largest organizations are adopting cloudbased infrastructure and services at a dizzying pace, driven by cloud’s attractive pay-as-you-grow pricing and its flexibility and agility, such as the ability to add capacity as needed. Software as a service (SaaS) offerings such as Salesforce. com and Microsoft Office 365 are among the more popular cloud-based services. 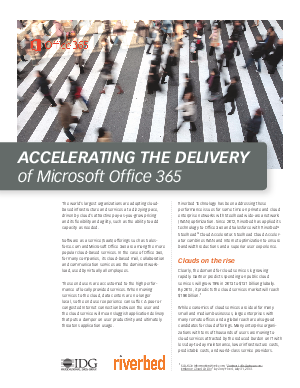 In the case of Office 365, for many companies, its cloud-based mail, collaboration and communication services are the dominant workload, used by virtually all employees.